Last updated by Mark Jala at November 28 . PFOA free nonstick cookware should be healthy cookware, right? It might not be. 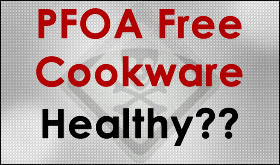 Consumer advocate Mark Jala issues a warning to all buyers of healthy and safe cookware that just because a cookware advertises as PFOA free that it may not be healthy or safe cookware. The problem lies in that huge companies making millions of dollars on PFOA over the years are not going to stand by and just watch that money go away. DuPont, 3M, and other makers of PFOA have replaced PFOA with another chemical compound. Time will tell just how good, or how bad, it really is. PFOA has been manufactured in industrial quantities since the 1940’s. It is not a new product. It helps create a slick surface. Today, PFOA is applied to pre-treated carpets, carpet care liquids, apparel, upholstery, textiles, medical garments, floor wax and wax removers, tile sealants, food contact paper, dental floss and of course, cookware. Studies show 98% of all people have PFOA in their bloodstream right now. Imagine you come home from work, tired and exhausted. You take your coat off and walk on your ScotchGuard protected carpet and plop down on your stain resistant sofa. It feels so good to relax. You take in a good deep, relaxing breath. Little did you know that the dust you stirred up walking on the carpet and sitting down on the sofa lifted up tiny particles of PFOA that is now being inhaled in that relaxing deep breath. Congratulations, you are now one of the 98% that has PFOA in your system. A good history about PFOA and how deceptive the manufacturers have been over time can be found here at Environmental Working Group. Is Anodized Aluminum Cookware Considered Safe Cookware? Healthy cookware has come of age. I see more safe cookware on the market than ever before. Here are the trends I see. First, let me confirm that there are no changes in the safety of teflon or other traditional nonstick coatings that contain PFOA and PTFE. On their website, DuPont continues to claim that their coating is safe to cook with using normal temperatures. When overheated they acknowledge the fumes are toxic and cause a condition in humans called polymer fume fever. The potential danger comes from overheating the pan, scratches through the coating to the real cookware material, and harm from ingesting peeling flakes of the nonstick coating. More information can be found in my original article about safe and healthy cookware. Second, let me confirm there are no changes in the safety of anodized aluminum. All manufacturers still advertise the material as safe. The potential danger comes from scratches in the surface that can lead to aluminum leaching into your food. More information on the aluminum issue can be found in my article about Anodized Aluminum Cookware. If you want the assurance you are cooking with healthy cookware for you and your children, you have alternatives. You don’t have to be afraid high heat or scratches in the cooking surface are leaching harmful chemicals into your food. There are many selections that are considered healthy cookware. Stainless steel cookware is still some of the healthiest cookware available. One choice you will have to make when it comes to stainless steel is the non-clad, clad, and if clad, how much. Stainless steel cookware that is not clad will be inexpensive, but not very good cookware. Stainless steel by itself does not distribute heat very well. Consequently, cookware manufacturers insert a layer of aluminum and sometimes copper, in between the layers of stainless steel. This is called clad. The inserted aluminum is perfectly safe and cannot touch your food. Some stainless steel clad cookware only has the aluminum on the base where it distributes heat very well across the bottom. The more expensive and best performing cookware has aluminum fully clad not only on the base but also up the side walls. This surrounds your food with excellent heating and usually takes less heat to properly cook food. Stainless steel clad cookware is usually 3 or 5 layers. Sometimes you will find 7 layer cookware. The added layers can help, but usually just add to the cost. My favorite Stainless Steel Cookware Set is the Cuisinart Multiclad Pro. It is reasonably priced and the quality is near All-Clad quality. I’ve been using some pieces for a long time and love them. Cast iron cookware comes in 2 varieties: preseasoned or enameled. The old standard is the preseasoned which builds up a near nonstick surface over time. Enameled cast iron cookware is very attractive with a variety of colors, and offers a near nonstick surface also. Cast iron cookware is heavy. It is not great to use on flat top stoves because of the weight and possible scratching. My favorite cast iron cookware comes from Lodge. Whether preseasoned or enameled, Lodge is excellent quality and offered at bargain prices compared to the very high quality Le Creuset or Staub. Cookware manufacturers are offering more ceramic type cookware, usually as an interior coating. It tries to compete with the nonstick coatings and some do a pretty decent job. While most clay cookware is for inside the oven, there is 1 brand that has an excellent product for stovetop use also. Clay cookware offers superb heating characteristics. My favorite Clay Cookware is the Emile Henry Flame Top Cookware. Lastly we have a selection of cookware advertised as “green” or eco-friendly. Some of these have ceramic interiors. We have to be careful of some advertised as “green” because while they take some measures to be eco-friendly, they still have chemicals either in the product or used in the manufacturing stages. Not all of those are bad either, making the choices even more difficult. The only ones I suggest being really careful of are the ones advertised on TV having marble, concrete, or diamonds in the cooking surface. My favorite “green” cookware is Scanpan . More than just a coating, the cooking surface is an integral part of the cookware and very good at being nonstick. And it is dishwasher safe. Another one I like that has survived my long-term testing is the Cuisinart GreenGourmet . As a final word I’d like to recommend a tip. As the founder of the Home Cooking Academy, offering online cooking classes, I push my cookware to the limits. My personal preference is stainless steel, but stainless steel is horrible for delicate dishes like eggs and fish. Add cheese to your omelet and you’ll have a cleaning mess as it will stick badly to stainless steel. Regardless of which route someone takes, I always recommend a stainless steel and a nonstick skillet, preferably 12″. A stainless steel skillet is excellent for saute and searing food where you’ll deglaze the pan with a cold liquid to make a great sauce. The nonstick skillet will be used for your omelets and fish fillet dishes at lower heat levels. Scanpan and Cuisinart GreenGourmet are excellent choices for the healthy nonstick skillets. A Cuisinart Multiclad Pro skillet is great if you have a set of something other than stainless steel. Can certain cookware be considered safe cookware or healthy cookware? I go over what makes cookware safe and healthy. You might be surprised at a couple cookware materials! We’ve all heard the phrase “We are what we eat.” We probably haven’t thought of that in terms of aluminum, stainless steel, cast iron, glass, or polytetrafluoroethylene. Your Cookware Helper tries to make your cookware decisions as easy as possible. We were the first to introduce a logo to easily identify dishwasher safe cookware. Now, I am happy to introduce you to the Healthy Cookware logo. Soon, you will be seeing it on all the pages identifying the cookware known to be safe and healthy. As I write this article and summarize the facts, I don’t need to remind you that ultimately it is you who has to take control and responsibility for your health. As you review this information, you have to decide if what you are presented with makes sense for you. Understand that cookware manufacturers are always going to claim their products are safe. There are industry associations, representing manufacturers, who may conduct some tests and claim certain product lines as safe cookware. Regardless of these claims, it is still you who has to decide whether you believe the tests and arguments presented. History is prolific with examples of products claimed to be safe, tested as being safe, but ultimately recalled or slowly banned from use. Doctors once advertised and promoted cigarette smoking as good and safe. That is one example the medical community would love to forget. So as you read what is presented, it is OK to be skeptical of certain claims and tests. It is your health, and you know you are responsible for your own health. What Makes Healthy Cookware or Safe Cookware? The most important health factor to consider is the transfer, or leaching, of the cookware cooking surface to the foods being cooked. External surfaces that do not come in contact with food are not a health concern. Copper cookware was once used as a common material to cook food. It was later discovered that native copper interacts with foods, especially acidic foods, and is highly toxic. Today copper is only used clad in between other cookware materials or on the outside, and not on internal cooking surfaces. Another factor is not just the internal cooking surface, but what happens to that cooking surface when it is heated. Heat changes the composition of materials. What may be safe at room temperature can be extremely toxic when applied to a heat source. Is Nonstick Cookware Healthy and Safe Cookware? Teflon is a patented product, discovered in 1938 by DuPont, and approved for cookware by the FDA in 1960. Many lawsuits have been filed over the nonstick surface both as a cookware and in its manufacturing. DuPont acknowledges that when their non stick surface is heated beyond a certain level, it can kill birds and create a sickness in humans they call Polymer Fume Fever. It produces symptoms resembling a cold. All nonstick surface manufacturers claim their products are safe. The FDA does not OK a product as “safe” but rather that it is safe for use in cookware. There have been no published studies on the effect of ingesting chipping and peeling non stick surfaces have on humans. I do not consider traditional DuPont nonstick style surfaces to be considered healthy cookware or safe cookware. There are safe and healthy nonstick cookware alternatives, however. DuPont style nonstick cookware has chemicals used in production and use, like PFOA and PTFE, that are known cancer causing agents. Is Hard Anodized Cookware Safe Cookware? Since the 1970’s when Canadian researchers reported that the brains of Alzheimer’s disease victims contained abnormally high levels of aluminum, aluminum cookware has been under fire. “Now cookware manufacturers have developed a process for treating aluminum that retains the heat conductivity properties of the metal, but changes aluminum in other ways. The process, called anodization, involves a series of electrochemical baths that thicken the oxide film that forms naturally on aluminum. This supplemental coating hardens the metal, making it more scratch resistant. Food barely sticks on the hard, smooth surface of this altered aluminum, making it easier to clean.” FDA Consumer Magazine. Manufacturers and industry lobbyists all claim it is safe. There is a strong argument in their favor in that the aluminum has been treated, albeit electrochemically, and what the food is cooking on is technically no longer standard aluminum. Aluminum is ingested from so many food sources today, the amount leached from cookware, about 35 micrograms, is a fraction ingested from a single antacid tablet, as much as 5,000 micrograms. Hard Anodized Aluminum Cookware that is in perfect condition appears to be safe cookware. My caution comes under 2 circumstances: 1) Avoid anodized aluminum cookware once it has become scratched and the native aluminum can leach through, and 2) Avoid it if your health routine already has you avoiding aluminum from your diet. Additional information can be found on our Anodized Aluminum Cookware page, or the article Is Anodized Aluminum Cookware Safe. UPDATE: Since I originally wrote this article, most anodized aluminum cookware comes with a nonstick surface at least on the inside. There are very few product lines available today where food is cooked on the anodized aluminum surface. When it comes to the health aspect, you have to consider the nonstick surface. Is Stainless Steel Cookware Healthy Cookware? Stainless Steel is considered a safe and healthy cookware, with one caveat. It is usually recommended that the inside cooking surface of stainless steel cookware be 18/10 stainless steel. That 18/10 means 18% chromium and 10% nickel. The published safe intake rate of chromium is 50-200 micrograms per day. One meal prepared in 18/10 stainless steel cookware gives you about 45 micrograms. So, that is fine. When it comes to nickel, some people are allergic to nickel. It is thought that the average adult consumes between 150 to 250 micrograms of nickel per day. Even when cooking highly acidic foods like tomatoes or rhubarb, it does not give off anywhere near that amount. If someone is highly allergic to nickel, an alternative is to use a stainless steel cookware with less nickel, like 18/8 or 18/0. Additional information can be found on our Stainless Steel Cookware page. What Cookware Materials Are Considered Healthy and Safe? Most cooks desiring to cook with healthy cookware will usually use glass/ceramic/stoneware, cast iron, and stainless steel. There is a reason why glass is used in lab experiments. It is not porous and does not react with its contents. Glass cookware has been around for a long time and still used heavily today. Ceramic cookware, though can chip, can have excellent heating properties and be easy to clean. Stoneware can be shaped and colored to be suitable for many decors. Though used primarily inside the stove, there are some pieces that can be used on the stovetop. Additional information can be found on our Glass Cookware page. Cast iron, plain or enameled, is an excellent choice because of its long lasting heating abilities. The enamel surface is glass based, not paint based. Additional information can be found on our Cast Iron Cookware page. In this article I summarized the findings on the health aspects of dominant cookware materials. Be sure to check out the links to the individual materials of interest. It is important that everyone take charge of their health, and become knowledgeable about healthy and safe cookware materials.